The information in Fund News is not an investment recommendation to you on the suitability of investing. We don't offer advice. If you're unsure, seek independent advice. The value of investments can fall as well as rise. You may get back less than you invest. The fog of uncertainty won’t disperse anytime soon, says Rathbones head of asset allocation research Ed Smith. But the FTSE is an international market, defensive and quite possibly one of the better places to be as global growth slows. The EU and the UK have agreed to delay Brexit until 31 October if a solution cannot be found sooner. This plays into our ‘never-ending story’ scenario, which we have thought the most probable path since last July. Sterling barely moved on the news, showing investors still believe that ‘no deal’ remains a significant risk. The fog of uncertainty remains and we do not expect international fund managers to return to UK markets with confidence. This same fog will also continue to weigh on economic growth. UK financial services would have to seek ‘third-country equivalence’ under a number of separate pieces of EU legislation, which allows for firms from a country outside of the European Economic Area (EEA) to operate in EEA member states on similar terms to those granted by the financial passport as long as the third country’s regulatory and supervisory arrangements are judged equivalent to the EU’s. Market access is based on continuously demonstrating regulatory equivalence between the third country and the EU. At present third-part equivalence regimes are pretty much untested, but legal experts concur that they would entail a potentially laborious and certainly costly compliance process. There’s a good chance of these regimes being used as political leverage by the EU too, and potentially removed at short notice. Furthermore, not all financial services activities that can be passported under the current system are even eligible for third-party equivalence. In other words, there may be a complete loss of access to the EU market for some businesses. There is no third-party equivalence regime for banking services such as lending and deposit-taking under the Capital Requirements Directive (CRD IV). Or retail asset management, under Ucits. Or direct insurance under Solvency II (reinsurance is covered). We believe that the foreign exchange market had priced in a very high probability of a hard Brexit. We anticipate sterling appreciating over the next three to five years, regardless of the nature of the deal that is eventually struck. On a long-run basis – the only timeframe over which we believe currency forecasts can be made with any certitude – sterling is very undervalued. But as we have discussed, ‘no deal’ is not off the table, and we fully expected the pound to stay volatile and under pressure. Interest rate futures aren’t pricing in another rate rise until 2023. We believe that rates will stay low for a long time, but no rate rise for four years is unlikely so long as Brexit proceeds in an orderly manner. Remember that Brexit depresses both supply and demand, so GDP growth around 1.5 per cent will likely be consistent with 2 per cent inflation. GDP expansion higher than that will necessitate tighter monetary policy. We don’t envisage that until next year. A stronger pound would present a headwind for the large multinational companies in the FTSE 100 that derive most of their earnings overseas in non-sterling markets. There is a good case for a softer Brexit resulting in both a stronger pound and a stronger FTSE, a typically unusual occurrence because those foreign earnings are worth less in sterling when the pound rises. Why could it be different this time? Because the FTSE is so under-owned by global investors. The most important thing to remember is that the typical UK investor is a global investor. Even if you only held companies listed on the UK’s FTSE 100 index, 70-80 per cent of the underlying revenues originate overseas. And Brexit is not a globally systemic event, like the financial crisis of 2007-08 or the European debt crisis of 2011-12. Brexit has become a national obsession, albeit a reluctant one for most. Remember the good old days when it was only the miserable weather that dominated our conversations? Unfortunately, Brexit is going nowhere anytime soon. It will continue to affect the UK economy even when nothing seems to be happening –as shown by the substantial falls in business investment. But well-diversified UK investors shouldn’t fret too much. When your home market is defensive, undervalued and global, it should help make your assets that much safer. 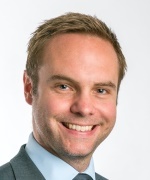 Ed Smith is head of asset allocation research at Rathbones. The views expressed above are his own and should not be taken as investment advice. As we take a break for the Easter Bank Holiday, FE Trustnet reveals the stories that were popular during the opening months of the year. FE Trustnet stories revealing the fund vying with Fundsmith Equity for dominance in the global sector, the research trends of professional investors and who has paid out the most income have proven to be popular in 2019. The opening months of the year have presented investors with some very different conditions to 2018, with stock markets across the globe rallying to generate double-digit total returns. 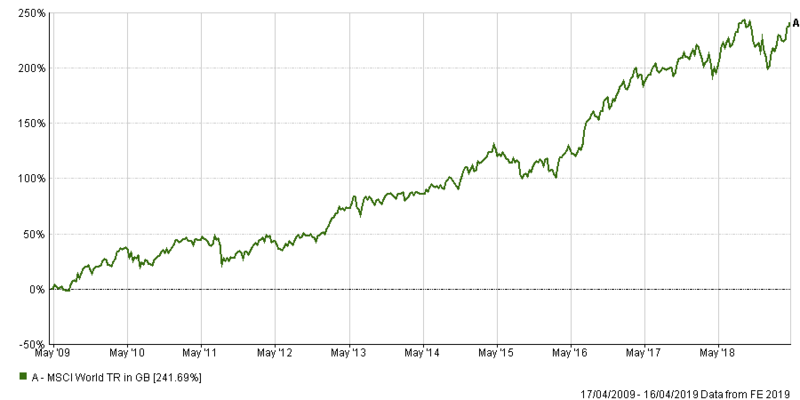 Even the FTSE All Share has made a 12.77 per cent total return, in spite of the uncertainty being created by the Brexit process. This bullish mood can be seen in the most popular stories on the website over the past three or so months as they tend to focus on fairly ‘risk-on’ topics – apart from the second most-read, that is, which highlights areas to avoid. With the long bank holiday ahead of us, below we reveal the most popular FE Trustnet stories of 2019 so far. Enjoy your weekend, dear readers. Terry Smith’s fund had been the IA Global sector’s best performer for the past two years in our annual research series but moved down the rankings in 2018. Several investment commentators highlight the areas of the market they will be steering clear of this year, such as absolute return funds, gilts and European equities. This exclusive research finds out which funds became more popular with professional investors using FE Analytics in March. FE Trustnet restarts its popular annual series by assessing IA UK All Companies funds through a wide range of viewpoints. Senior analyst Laith Khalaf highlights four closed-ended strategies that could form part of a balanced portfolio capable of withstanding Brexit. FE Trustnet reviews every open-ended fund to find out which made the largest income payouts to their investors last year. After a decade of quantitative easing in the UK, FE Trustnet discovers which funds have generated the best returns for their investors. Last year gave investors a tough ride and many lost money – but some bounced back within the opening days of 2019 thanks to a significant rally. FE Trustnet news editor Rob Langston explains why he is continuing to back the worst performer in his portfolio. Research by Natixis suggests that multi-asset strategies did little to aid investor portfolios during the turbulent conditions of the past year. The Premier multi-manager highlights an underperforming fund that generated strong returns when everyone else was losing money. Being strongly opposed to the US and bullish on emerging markets has been a risky and aggressive position in recent years, according to Premier’s Simon Evan-Cook (pictured), although the final months of 2018 proved it isn’t always a one-way bet. In fact, the manager – who runs the £209.5m Premier Multi-Asset Global Growth fund alongside David Hambidge, Ian Rees and David Thornton – said this is the stance that paid off in the fourth quarter of 2018 and led to an underperforming holding flourishing. “Everyone in the US expects it to be brilliant and plain sailing. But if they get a shock there’s going to be a lot of money coming out of that market,” said Evan-Cook. The US has led the way for the bulk of the post-crisis rally while emerging markets have lagged the developed world for much of the past decade. However, FE Analytics shows that this dynamic was reversed in the heavy sell-off that struck global equities in the final three months of last year. “What a lot of people think is the highest quality and the most defensive market actually turned out to be the worst [in Q4]. That was by most people’s reckoning a terrible quarter for equities,” the multi-manager said. “But we had some emerging market funds that went up by 3 or 4 per cent over that three-month period, just because everyone who could possibly have sold all the emerging market stocks that they hold had already sold them over the last three years. So, you actually ended up making money over that period because they had their own things going on. That outperforming fund was HMG Global Emerging Markets Equity, which is a Luxembourg-domiciled Sicav that was launched in November 2014 as a joint venture between Goodhart and HMG. The fund has a value approach to investing (which has been out of favour for much of the past decade) and focuses on the emerging market subsidiaries of long established and well managed developed market companies that have a history of profitable overseas expansion. 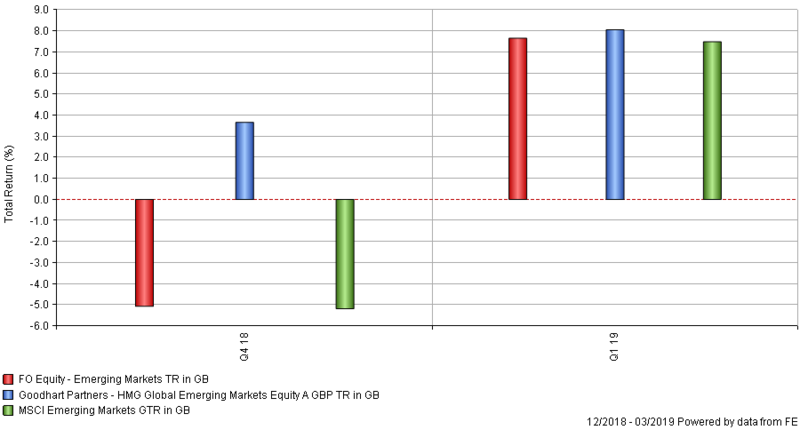 Premier’s multi-asset team monitored the fund at launch but at the time emerging markets were suffering a sell-off and the new HMG Global Emerging Markets Equity fund was hit harder than most of its peers because of its exposure to Latin America and energy companies. However, the multi-managers added to it to Premier Multi-Asset Global Growth in September 2015 after speaking with the managers and deciding that the underperformance was down to market whims rather than poor decision making. “This means we have been able to buy into this portfolio at an attractive valuation and a decent starting yield, both of which should contribute to the superior long-term returns we are aiming to generate in our own fund,” the Premier team said at the time. 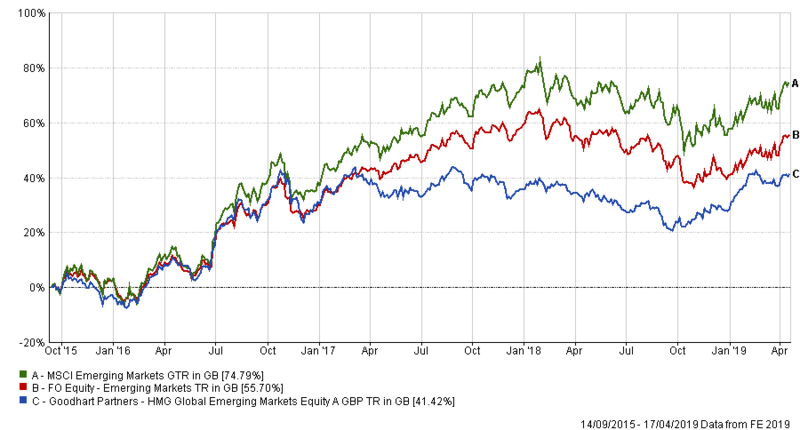 Since being added to the multi-manager portfolio, HMG Global Emerging Markets Equity has made a 41.42 per cent total return – underperforming its average peer and the MSCI Emerging Markets index. However, it has come into its own more recently and is up 13.93 per cent since the start of 2018’s fourth quarter, while the index has made 5.21 per cent. Indeed, performance in both the final quarter of 2018 and the first quarter of 2019 has been above that of both its average peer in the FO Equity – Emerging Markets sector and the MSCI Emerging Markets index. Evan-Cook puts its recent outperformance down to the fact that its contrarian positioning left it relatively insulated from the selling that was taken place in the rest of the market during the panicked conditions at the end of last year. An allocation to a small-cap value emerging market fund isn’t the only contrarian positioning in Premier Multi-Asset Global Growth. 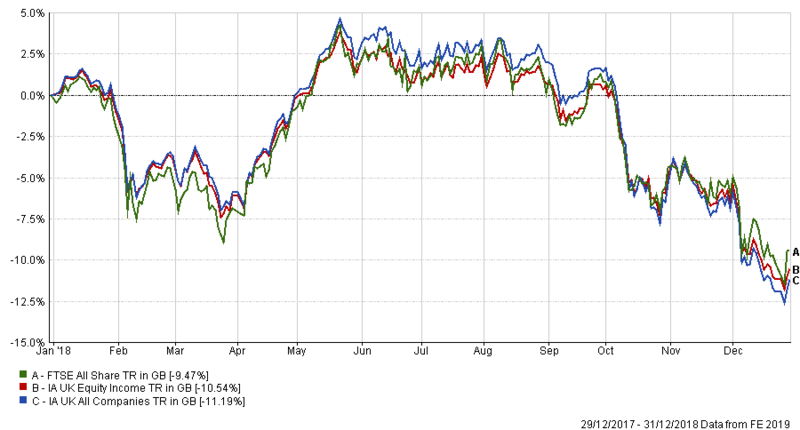 For some time, the fund – and the other portfolios run by Premier’s multi-asset team – have been underweight the US. “At some point [the US] just cannot carry on getting more expensive and everything else will catch up and US equities will catch down,” Evan-Cook said. “This reminds me a little bit of 1998-2000 which was the tech bubble. The markets were split in two, where tech and growth went up almost exponentially. While the correction of 2018’s fourth quarter has blown some of the froth off of US equities, the manager added that it would take several years of US underperformance for valuations to reach a level low enough for him to slowly invest his fund there. A more constructive stance on UK equities - Premier Multi-Asset Global Growth has 17.3 per cent of its portfolio here – is another contrarian stance from the manager. Investors have avoided the UK because of the uncertainty created by Brexit but Evan-Cook argued that this has left the market looking good value. “If you’re a global equity fund manager and you’re sitting in New York, the UK equity market only makes up 5-6 per cent of the global equity market. They can spend a lot of time rooting around here trying to find really good ideas but end up thinking: ‘I could do that and then Brexit will go wrong, so I’ll just not bother for now until Brexit has gone away’,” he said. Since being taken over by its current managers in July 2012, Premier Multi-Asset Global Growth made a 119.27 per cent total return – ranking it sixth out of 101 funds in the IA Flexible Investment sector. It is top quartile over three and five years but slips into the peer group’s third quartile for the past 12 months. The fund has an ongoing charges figure (OCF) of 1.71 per cent. Troy Asset Management’s James Harries says global equity income investors need to be a bit more cautious about the types of stocks they buy. Elevated valuations and questions over the longevity of the current market cycle make it a difficult environment to navigate, according to Troy Asset Management’s James Harries, who remains cautious despite a more auspicious start to 2019. Harries, who manages the £149.2m Trojan Global Income fund, said that after more than 10 years of extraordinary monetary policy we are at a “very unusual juncture of capital markets”. Valuations remain elevated, boosted by a tide of liquidity from central banks in response to the global financial crisis. 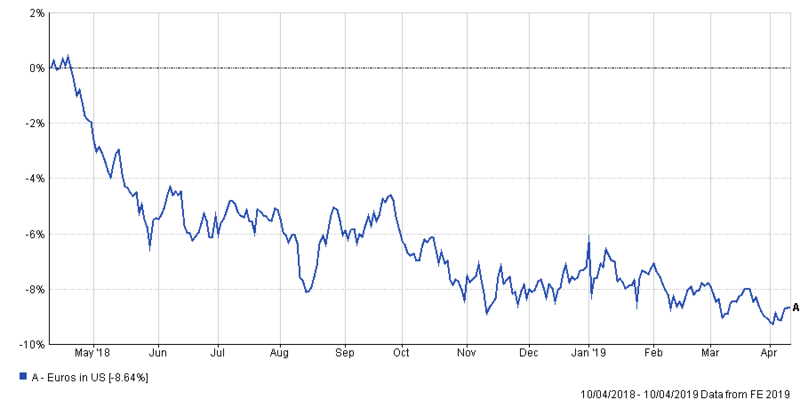 As the below chart shows, the MSCI World has risen by 241.69 per cent, in sterling terms, over the past 10 years. There seems little support for a big structural upturn for markets too, said the equity income manager, the last of which occurred in 1981 when conditions were very different. Coming off a difficult decade, conditions in the 1980s were much more conducive with high interest rates, high US 10-year Treasury yields, high inflation, lower public debt, higher savings rates, more attractive equity valuations and a supportive demographics. “Unfortunately, today none of that is the case,” he said. “We have a much lower bond yield, low interest rates that can go up a little bit but not very much, pretty low inflation, much lower savings rates and much less attractive valuations. As such, this has created an environment where investors need to be more cautious, particularly in a market where disruption of traditional business models has increased with the rise of new technologies. Given this cautious backdrop, Harries noted that Troy is concentrating on companies that display high and sustainable returns on capital employed, free cash flow generation and long-term dividend growth potential while trading at reasonable valuations. 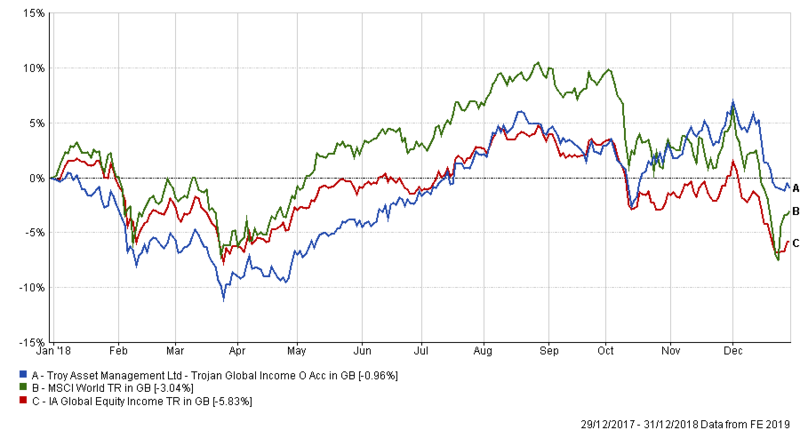 Trojan Global Income also avoids companies and sectors that are limited in terms of cyclicality and capital intensity. Altogether, Harries said, this should lead to long-term returns. However, that can take some time to appear. “When we launched two-and-a-half years ago the entire quality element of the market was pretty fully valued; it certainly was not apparent at the time but we know in hindsight that was the case,” he said. 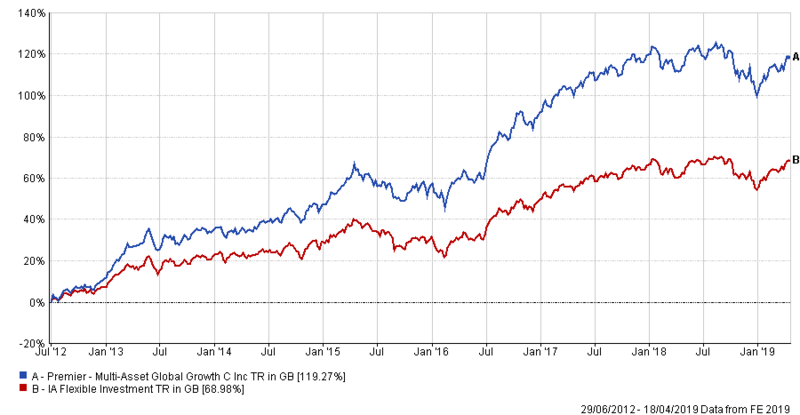 In 2018, Trojan Global Income outperformed both its benchmark and the IA Global Equity Income peer group, albeit making a 0.96 per cent loss. Harries’ approach to management also means that the fund might not look like a traditional equity income fund at times, something he attributes to allocating away from the benchmark. “If you concentrate your efforts and resources on particular sectors you think are inherently attractive, that takes you away from the benchmark approach,” he explained. Launching at a time when quality businesses appeared fully valued meant taking some tough decisions to start with, said the manager. “In order to generate a reasonable income, we augmented these view with some lower quality but more predictable businesses at that point in time,” he said. Not all decisions are based on a deterioration in quality, however. A more recent development in the portfolio, the manager said, was its decision to sell of US tobacco company Altria following its $13bn investment in vaping company Juul, which he said was a “sub-optimal allocation of capital”. Some of this capital was recycled into Philip Morris, which the manager said was trading at extremely attractive valuations for a company with a high quality global franchise. Harries also added to the fund’s holding in UK company Domino’s Pizza Group despite a public row with its franchisees over sharing of profits, which has sent it to more attractive valuations. 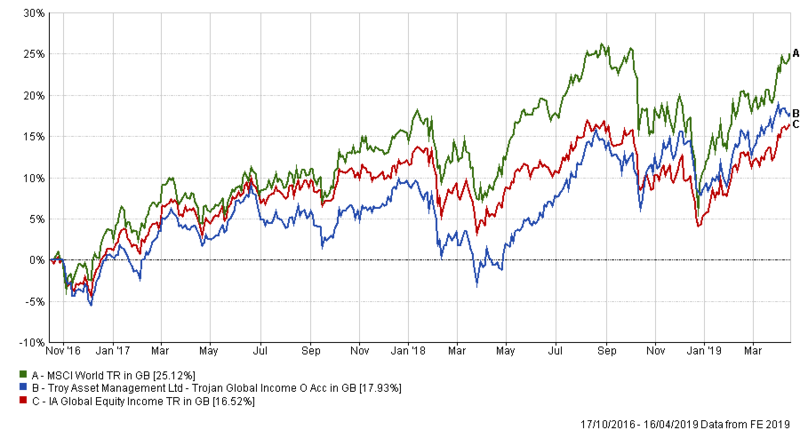 The Trojan Global Income fund has made a return of 17.93 per cent since launch in October 2016, underperforming the MSCI World benchmark’s 21.12 gain. Over the same period the average peer has made a 16.52 per cent total return. It has a yield of 2.93 per cent and an ongoing charges figure (OCF) of 0.96 per cent. Research by Bank of America Merrill Lynch shows asset allocators expect a low growth, low inflation and low interest rate environment to affect markets. Fund managers across the globe continue to position for a climate of ‘secular stagnation’, asset allocation research shows, tilting their portfolios towards investments that hold up in a falling growth environment. The latest edition of the Bank of America Merrill Lynch Global Fund Manager Survey found that professional investors are long assets such as cash and defensive sectors, which tend to outperform when economic growth and interest rates are falling. Conversely, fund managers have less exposure to areas that require higher growth and rates to perform, such as equities in general and banking stocks in particular. Two-thirds of respondents to the Fund Manager Survey (FMS) believe the global economy is in a state of ‘secular stagnation’, or in a persistently low growth, low inflation environment. This is the highest level thinking so since October 2016. “FMS investors added a bit of cyclical risk this month but are still firmly positioned for secular stagnation,” said Michael Hartnett, chief investment strategist at Bank of America Merrill Lynch. As Hartnett noted, there are signs that investors have added some cyclical risk since the survey was carried out in March. 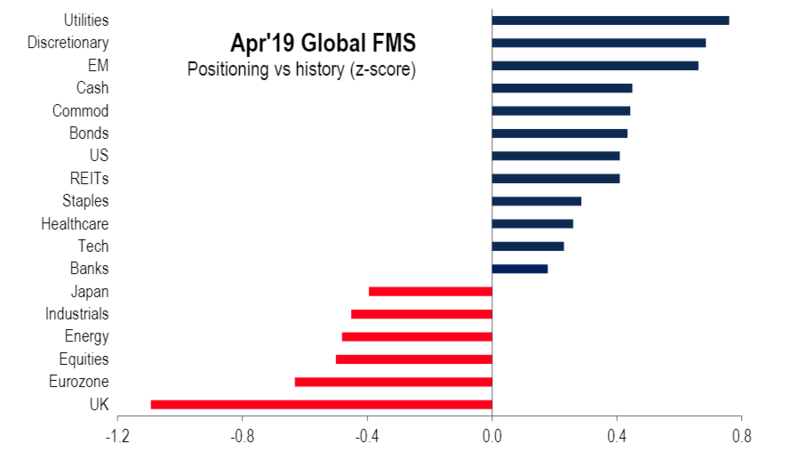 Asset allocators did increase their weighting to areas like equities (from very low levels in March), the eurozone and commodities. However, global fund managers scaled back their exposure to banks this month despite willingness to add risk in other areas. Allocators are running a net 1 per cent underweight to global banks, down four percentage points month-on-month to the lowest reading since September 2016. But the Bank of America Merrill Lynch Global Fund Manager Survey – which polled 187 participants with combined assets under management of $547bn between 5 and 11 April – reassures that investors are not expecting a recession any time soon. Some commentators have pointed to the recent inversion of the US Treasury yield curve as a sign that a recession is looming. This measure has often heralded a recession in the past but 86 per cent of the survey’s respondents do not think this is the case today. When will the next global recession start? Some 6 per cent of fund managers think a global recession will start in 2019 but around seven out of 10 say there will not be an economic contraction until the second half of 2020 or later. And while investors are expecting low growth, their concerns appear to have eased over the past month. A net 5 per cent of fund managers believe global economic growth will weaken over the coming 12 months but this is a big improvement from March – a balance of 25 per cent were expecting weaker global growth in last month’s survey. But on the whole, managers are downbeat on the direction of travel for the economy and this shows in the assets that they expect to outperform over the coming years. According to Bank of America Merrill Lynch Global Fund Manager Survey respondents, high-quality stocks are expected to beat low-quality, large-caps will beat small-caps, high dividend stocks will beat low dividend stocks, low volatility will beat high volatility and high-grade bonds will beat high yield. Considering the specific risks on fund managers’ radars, trade war and an economic slowdown in China were the most commonly cited tail risks. Both of these concerns were highlighted by 20 per cent of the survey’s respondents. In third place was a new tail risk: monetary policy impotence, chosen by 18 per cent of asset allocators. Other tail risks being watched include US politics, a corporate credit crunch, Brexit and European elections. Meanwhile, being short European equities is seen as the most crowded trade in the market today, with one-quarter of fund managers holding this view. It was followed by long FAANG+BAT (Facebook, Apple, Amazon, Netflix and Google plus Baidu, Alibaba and Tencent), long US dollar and long US Treasuries. When it comes to regional equity allocations, the UK remains the least favoured region among Bank of America Merrill Lynch Global Fund Manager Survey participants. “The allocation to UK equities held flat month-on-month at 28 per cent underweight as another Brexit delay was announced; sentiment has modestly improved from the max bearish 41 per cent underweight in March 2018, but few investors own the region,” BofA ML said. Global emerging market equities remain the consensus overweight in the survey, with a net 34 per cent of manager overweight the asset class. The European equities allocation jumped 8 percentage points from last month to net neutral, US equities have moved from being neutral to a small overweight and investors continue to move away from Japanese equities. The bursting of the dotcom bubble at the start of the 2000s and the financial crisis towards the end mean there are numerous IA sectors where investing for the long term has been no guarantee of a positive return. There are 11 sectors in the IA universe that have made a negative return for investors over a period of at least 10 years, according to data from FE Analytics. Investing is supposed to be a long-term activity, and it is recommended you commit your money for a period of at least 10 years if you predominantly hold equities. However, data from FE Analytics shows that even investing your money for this length of time is no guarantee that you won’t end up in negative territory. Unsurprisingly, IA Japan tops the list with the longest period of negative returns. The launch of the IA sector coincides almost perfectly with the peak of the Topix index before Japan entered its well-publicised lost decade (or two) as it suffered from deflationary forces. Someone who invested in the sector at launch at the start of 1990 would have still been sitting on losses in May 2014 – a period of 24.4 years. Less predictable perhaps is the sector in second place: IA Technology & Telecommunications. The FAANGs – Facebook, Apple, Amazon, Netflix and Alphabet (Google) – in the US and the BATs – Baidu, Alibaba and Tencent – in China have been responsible for much of the growth in global markets over the past decade and, as a result, IA Technology & Telecommunications is the best-performing IA sector over this time, with gains of 407.31 per cent. However, it has yet to fully shake off the legacy of the dotcom bubble and someone who invested in the sector in March 2000 would still have been sitting on losses at the end of 2018, almost 19 years later. Despite the spectacular gains of the past decade, it is still up just 21.39 per cent from its peak at the turn of the century. Industry commentators regularly remind investors about the importance of diversifying their portfolios and may argue that these figures underline the dangers of failing to follow this advice. Many also recommend equity income as a useful tool for cushioning market corrections, as reinvesting the dividends means you will be taking advantage of any falls by automatically buying shares at a much lower price. However, the sector with the fourth-longest period of negative returns combines both these tenets: IA Global Equity Income was still in negative territory almost 13 years after the bursting of the dotcom bubble. So, do these figures suggest investors should keep at least one eye on market timing? Adrian Lowcock, head of personal investing at Willis Owen, doesn’t think so, pointing out that the 2000s were something of an anomaly. He carried out his own research which showed investors with a diversified portfolio who commit their money over 10-year periods make a positive return 95 per cent of the time. “The one exception to that in the past 20 years was effectively if you bought at the peak of the dotcom bubble, as your 10 years on was effectively the bottom of the financial crisis,” he adds. “It is time in the market, not timing the market. But there are always exceptions that prove that rule and one of them was if you were really unlucky, you bought at the top of the dotcom bubble and that was all you did. Investors who diversified by asset class and not just geography would have been relatively well protected even through the 2000s, with most fixed income sectors seeing minimal periods over the past 20 or so years when they were in the red. This doesn’t mean investors should pile up on bonds now – even though central banks appear reluctant to raise rates much further from here, many experts warn they could be at the start of their own bear market. Last year, AJ Bell’s Kevin Doran predicted they will underperform inflation over the long-term. However, Lowcock says the figures show the advantage of regularly rebalancing your portfolio and Kerry Nelson, managing director of Nexus IFA, agrees with him. “In the environment we are in now actually there is no rhyme or reason to what is going on in the world,” she explained. “There are lots of underlying significant issues and any one of those things could tip us into a really bad position. “It is understanding how to position yourself in a differing environment to make the most of things but also to shelter yourself when you need to. And that does need re-evaluation, that is not a static scenario. She adds that the results of the study show why investors shouldn’t get so hung up on trying to beat the market or a sector, but should instead aim for a target that is more suitable for them. “Those realistic benchmarks are more about inflation, CPI plus, so that is dependent on the risk you are prepared to take,” Nelson continued. “If I am a low-risk investor, I want to keep up with either RPI or CPI or a combination plus 1 per cent, because by doing that, that is really low risk. I just want to do a little bit better. Carmignac’s Didier Saint-Georges examines the effects that low interest rates can have on markets and the economy. The downside of persistently low interest rates isn’t obvious at first blush. Reduced borrowing costs for individuals and businesses alike clearly make it easier to purchase new equipment, buy a home or take out a consumer loan. But if we want to shine a critical light on the effects of low interest rates (even as they increase spending capacity), we have to move gradually up the scale from common sense to counterintuitive reasoning. Let’s start with common sense. Low interest rates reflect a certain recognition that things aren’t going so well. After all, if central banks keep their policy rates at rock-bottom levels, it’s certainly because they feel that investment and consumer spending need a helping hand. Moreover, the level of long-term rates – more than that of short-term rates – results from the natural equilibrium of supply and demand among market participants (unless central bankers step in as they did during the “asset purchase programme” years). So if long-term rates stay extremely low, it’s presumably because there aren’t enough long-range investment projects to push up the associated financing costs. A final explanation is that, with short-term rates unlikely to rise at a time of weak economic growth and negligible inflation, there’s no point in borrowing long-term – except at very low rates. Right or wrong, such bearish sentiment works, at least to a certain extent, like a self-fulfilling prophecy. This is particularly true in Europe, where economic activity is more directly dependent on bank lending, whereas US companies (mid- and large-cap) can turn more readily to capital markets for funding. The fact is that low interest rates hurt the earnings capacity of European banks in three ways. First, they make margins on loans highly visible, and thus harder to ‘sell’ to clients. Second, a large part of a commercial bank’s activity involves borrowing short-term and then lending long-term at higher rates, thus earning a profit on ‘maturity transformation’. So that when long-term rates are no higher than short-term rates (or even lower), maturity transformation ceases to be profitable. That is the main problem with flat yield curves. Third and last, the European Central Bank’s policies have driven short-term yields so low that they are now negative in several countries. In addition to being an unorthodox concept, negative interest rates mean that the cash held by banks costs them money instead of yielding a profit. Needless to say, the idea of charging retail customers for their deposits wouldn’t go over very well. So extremely low interest rates are bad news for banks, which in turn is bad news for economic growth. The upshot is a vicious cycle that pulls interest rates further and further down. Why? Because the self-fulfilling-prophecy aspect of low rates and flat or even inverted yield curves gets ratcheted up a notch. Conscious of the feedback loop between low rates and a feeble economy, market participants begin to price in a downward spiral in interest rates. Low interest rates thus go from being a cure for weak economic growth to being a harbinger of it. We have come full circle: we’re on our way to the next recession. From a macroeconomic standpoint, the reason why virtually free money is harmful is that extremely low interest rates allow companies to engage in relatively unprofitable investments – thereby encouraging the misallocation of capital, which creates very little wealth. In seeking to provide cheap credit, central banks have in fact blighted economies’ medium-term growth potential – and with it employment. In times of economic or financial crisis, an easy money policy makes sense, because it offers a powerful way to fend off the threat of a liquidity crunch that would cause the whole financial system to seize up, with disastrous consequences for the broader economy. The trouble starts when free money becomes the new normal, with no underlying crisis conditions to warrant it. At that point, the nefarious side effects have taken hold, and it’s extremely hard to shake them off – unless you lift the curtain on all the distortions to financial asset prices and capital allocation that have built up over the years. Above all in Europe, it is precisely this dark side of central-bank power that is revealed by today’s excessively low interest rates. Didier Saint-Georges is a member of Carmignac’s investment committee. The views expressed above are his own and should not be taken as investment advice. Sharp year-on-year rise in UK equity fund underperformance recorded by S&P Dow Jones Indices as all strategies struggled in a more challenging environment. There was a sharp deterioration in the performance of UK active equity funds in 2018 as just over a quarter of funds managed to outperform a comparable benchmark, according to data from S&P Dow Jones Indices. The biannual S&P Indices Versus Active Funds (SPIVA) Europe Scorecard found that active fund outperformance fell across the board last year. It was a challenging year for markets as a number of macroeconomic themes played out, increasing volatility and making it more difficult for some active managers to outperform. “A high proportion of active funds in Europe underperformed their benchmarks in 2018; this coincided with substantial drawdowns in global and European equity markets toward the end of the year,” said Andrew Innes, associate director at S&P Dow Jones Indices. Last year both the average IA UK All Companies and IA UK Equity Income fund posted double-digit losses and failed to outperform the FTSE All Share – a commonly used benchmark for the sectors – which fell 9.47 per cent in total return terms. As such, just 26.39 per cent of active UK equity managers outperformed the S&P United Kingdom BMI benchmark last year down, from 53.6 per cent in 2017. The average asset-weighted return for a UK equity fund in 2018 was a loss of 10.33 per cent, compared with a fall of 9.28 per cent for the index. 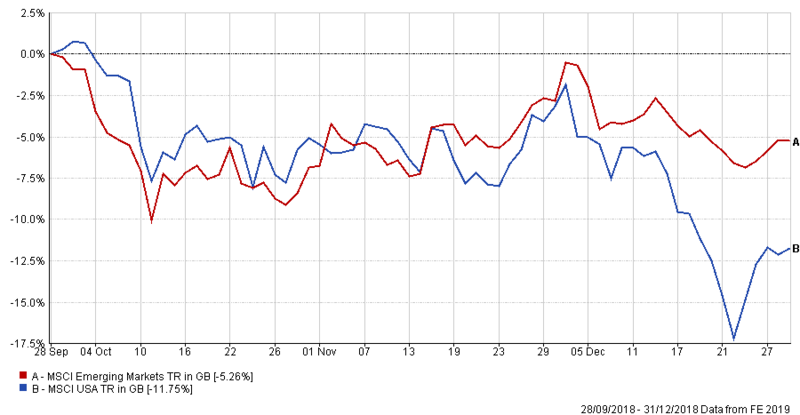 Over a longer 10-year period, 73.5 per cent of funds underperformed the benchmark. However, this is a slight improvement from one year ago where 75.2 per cent underperformed. According to the report the average, asset-weighted return for an active UK equity fund over the period was 9.66 per cent against a 9.12 per cent gain for the index. Underperformance over the longer time period was to be expected as the majority of active equity funds failed outperform their respective benchmarks over 10 years. There was a drop off in performance among UK small-cap funds with more than half (57.1 per cent) underperforming the S&P United Kingdom SmallCap index last year, compared with just 19.7 per cent in 2017. However, there was a small improvement over 10 years. The average UK small-cap fund made a loss of 12.84 per cent over one year, slightly greater than the 12.16 per cent fall for the benchmark. There was a significant deterioration in sterling-denominated active Europe ex-UK equity funds where just 18.5 per cent outperformed the S&P Europe ex-UK BMI index compared with 43.8 per cent one year ago. Performance over 10 years also worsened with 79.9 per cent underperforming the benchmark compared with 73.5 per cent at the end of 2017. Global equity funds also saw a big jump in underperformance over one year with the percentage of outperformers falling from 47.3 per cent in 2017 to just 23.3 per cent at the end of last year. As the below chart shows, the average IA Global and IA Global Equity Income fund underperformed the MSCI World index, another commonly used benchmark in each sector. It also remains difficult for active managers to outperform over the long term with just 7.7 per cent beating the S&P Global 1200 index. There were also low double-digit percentage point increases in underperformers for sterling-denominated emerging markets and US equity funds over one year. 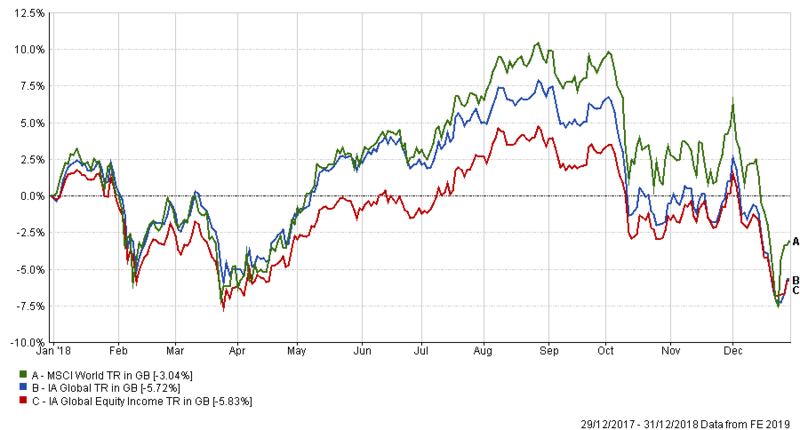 Underperformance of US equity funds came despite the S&P 500 being the only benchmark in positive territory last year. “Initially robust US market strength gave way to fears of an earnings slowdown, precipitated by disappointing financial results from high-profile information technology stocks in Q4 2018,” the report noted. The difficulty of outperforming the US equity market has been well-documented given how well-covered by analysts and its efficiency. 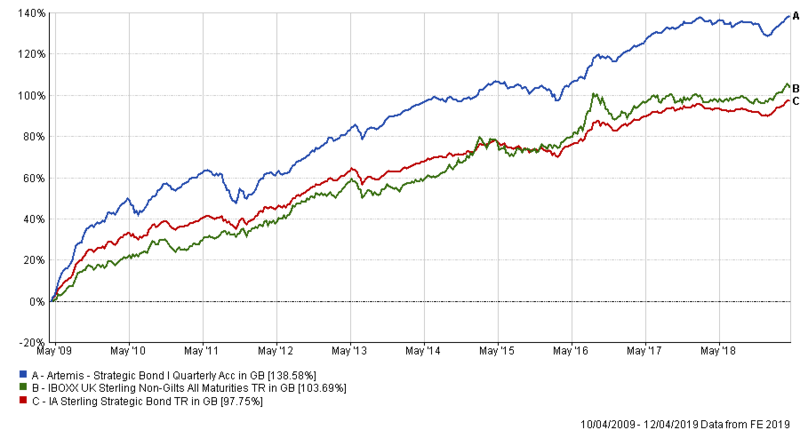 As such, just 8.1 per cent of active US equity funds have outperformed the benchmark S&P 500 index over 10 years. In 2018, the average fund made a loss of 1.33 per cent compared with a rise of 1.56 per cent for the index. Over 10 years the S&P 500’s 14.5 per cent return outpaces the 12.92 per cent gain for the peer group. 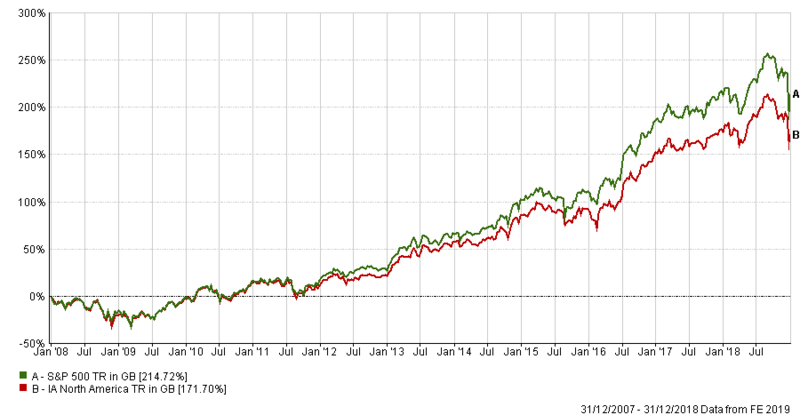 This can be seen in the performance of the IA North America sector against the S&P 500 index, where the average fund has underperformed over the past decade. “The majority of active fund managers underperformed in all 23 fund categories studied over 2018,” noted the study’s authors. In Spain, where.9 per cent of euro-denominated funds outperformed the S&P Spain BMI index in 2018. Last year the average fund fell by 10.91 per cent, on an asset-weighted basis, compared with a 11.05 per cent fall in the benchmark. The worst market for underperformance was in the Netherlands, where no euro-denominated active funds managed to beat the benchmark. The average Dutch equity fund fell by 13.87 per cent compared with an 8.72 per cent fall in the S&P Netherlands BMI index. Have investors lost faith in active management? Allianz Global Investors’ Andreas Utermann asks whether the active management industry can regain the trust of investors. In the face of a challenging market environment, active management is more relevant than ever but it requires a laser focus to both deliver to clients and stand out in a crowded consolidating market, according to Allianz Global Investors chief executive Andreas Utermann. This follows Allianz’s ‘Active is: Regaining trust in active management’ study, which surveyed 490 institutional investors and revealed that there is a lack of faith in active managers to perform long term and deliver a value for money service. Carried out anonymously, just 23 per cent of respondents believe that actively managed portfolios were worth the cost, leaving 77 per cent feeling a disparity between managers’ price and performance. Second to this, only 36 per cent said active strategies are more likely to outperform passive in the long run over full market cycles, with those in the UK being the most sceptic as only 18 per cent here believed in an ability to consistently outperform. “The biggest challenge in many ways, and the most sobering one. That the trust our clients have in the ability of asset managers to perform adequately is very low. Clients are convinced that the markets don’t provide much alpha; half of them believe that active strategy has a downside connotation in volatile markets,” Utermann said. This value for money debate has been has been running in the fund management industry for some time. The concern over the value of investing in an actively managed fund is not down to investors simply wanting a cheap option. When asked in the survey what would be one of their top three priorities when selecting a fund manager, only 6 per cent put fees as one of their primary concerns. The concern is not over cost, because according to the survey investors don’t confuse value with cost. They’re willing to pay for a service that brings clear benefits, aligning price with performance. 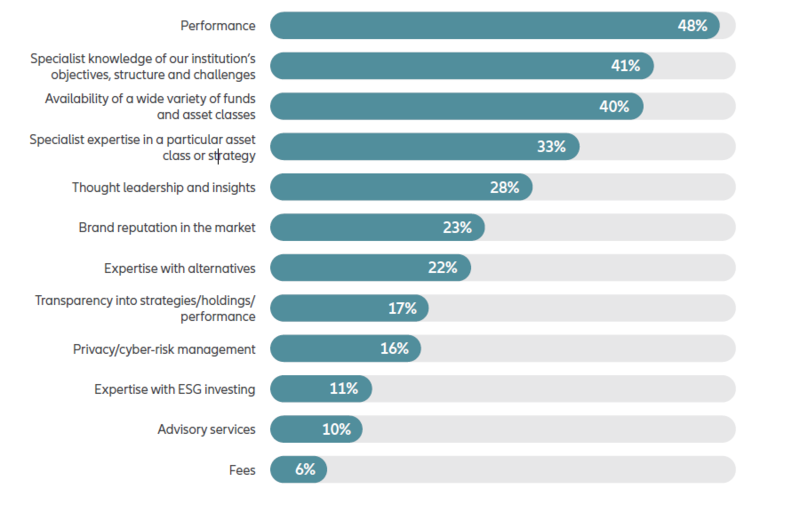 According to Allianz’s research almost half (43 per cent) of institutional investors feel that current fee structures do not meet their objectives, with 68 per cent saying that they would prefer fee structures that adjust according to performance. This factor is so important that over half (68 per cent) said that they would switch to managers who were offering more innovative, better aligned fee structures. “What is interesting to point out is that not 68 per cent of our clients are on performance fees. Whilst there’s a lot of runway still for there to be a change, at least conceptually clients believe that’s the best way to do it,” said Utermann. Allianz’s research suggested that there is a definite appetite for newer, flexible fee models more aligned with performance and pricing. One possible pricing option is allowing an investor to pay a performance fee once a fund’s underperformance has been rectified. This approach, Allianz said, could offer incentives to buy into funds and strategies with potential for future returns, rather than just favouring products that only recently performed well. In reaction to these findings, Utermann said: “The way we thought about it, with every challenge there’s an opportunity. “Only active management can provide the type of tailored, bespoke solutions needed to meet many of the investor challenges identified in our report around disruptive technology, innovative fee models and ESG. “Active is what we do. Passive investment is increasing in volume and there doesn’t seem to have an end to it, so why aren’t we hedging our bets by diversifying away from that? It’s our ethos. It’s how we believe we can best serve our clients and that’s why we’re single minded focused on it, but we’re going to keep coming back to this theme. The research unveiled a major gap in the relationship between investor and fund manager, according to Utermann, who believes one of the biggest failures of the asset management industry over the past 30 years has been managers failing to connect with clients on an emotional level. This combined with an ill-aligned pricing point directly feeds the growing distrust in fund managers’ abilities to deliver. But Allianz feels that this gap between client perception and behaviour can be bridged. “Creating a collaborative relationship, building value through tailored service and concrete support,” the report said. “Active management is not just about beating the benchmark it’s about active device, it’s also engaging with clients and finding out what they need and that’s an area that they’re really keen on. In the climate of fluctuating market conditions Allianz concluded that: “Investors want strategies to help manage emerging risks, knowing that thanks to quantitative easing, markets since the financial crisis have been unusual. FE Trustnet discovers which funds in the fixed income are winning a higher level of research on FE Analytics than you’d expect from their assets under management. Giant bond funds managed by Artemis, Fidelity and Rathbones are among those that professional investors are researching more than expected given their size, FE Trustnet analysis shows. As we’ve noted in a previous article, much of the research that takes place on FE Analytics – a fund analysis tool used by thousands of financial advisers, wealth managers, paraplanners and other professional fund pickers – goes into the largest funds in the Investment Association universe. Having examined the equity sectors, FE Trustnet now finds out which large fixed income funds are attracting even more research than their size would suggest. To do this, we calculated the average number of research hits that £1m in AUM brought into each of the Investment Association’s bond sectors over the past 12 months then filtered for funds with assets of more than £1bn and a hit ratio higher than this. The giant fixed income fund that is getting even more research than its size would suggest is Artemis Strategic Bond. Funds in the IA Sterling Strategic Bond sector receive an average 4.3 research interactions per £1m in AUM but this £1.5bn fund gets 17.5 – some four times higher than the average. 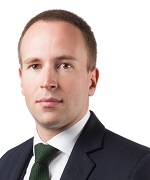 Managed by James Foster and Alex Ralph, the four FE Crown-rated fund is in the sector’s top quartile over the past three years while its 138.58 per cent 10-year return is significantly higher than the gain made by its average peer and its Markit iBoxx GBP Non-Gilts benchmark. NB Emerging Market Debt Hard Currency appears in second place in this study. It has assets under management of £1.2bn and received around 6.7 research views per £1m; this is 3.46 times higher than the average for the IA Global Emerging Markets Bond sector. The fund has a strong track record and is currently top-quartile over one, three and five years. It has made a 26.02 per cent total return over the past five years, which is impressive considering that its average peer has posted a 0.63 per cent loss. Headed up by Rob Drijkoningen with FE Alpha Manager Bart van der Made and Gorky Urquieta as deputies, the fund focuses on bottom-up country selection with the largest weightings at present being to Turkey, Argentina and Mexico. Factors such as duration positioning and corporate allocation take a secondary role in the process. In third place is another IA Sterling Strategic Bond fund managed by Artemis’ Alex Ralph: Artemis High Income. This £1.2bn fund has 14.8 FE Analytics research interactions per £1m in AUM, which is 3.45 times higher than the average for its peer group. Square Mile Investment Consulting & Research, which gives the fund an ‘A’ rating, said: “Given its focus on yield, the fund is likely to have a relatively aggressive return profile, tending to outperform in times of strong corporate bond returns, but lag when corporate bonds are falling. Fidelity Strategic Bond is next, with 13 research hits per £1m in AUM – 3.03 times higher than the average IA Sterling Strategic Bond fund. For the bulk of its track record, the fund was run by fixed income veteran Ian Spreadbury but Claudio Ferrarese and Timothy Foster took over at the start of 2019 when Spreadbury retired after a 40-year career. Rounding out the top five is Bryn Jones’ £1.3bn Rathbone Ethical Bond. 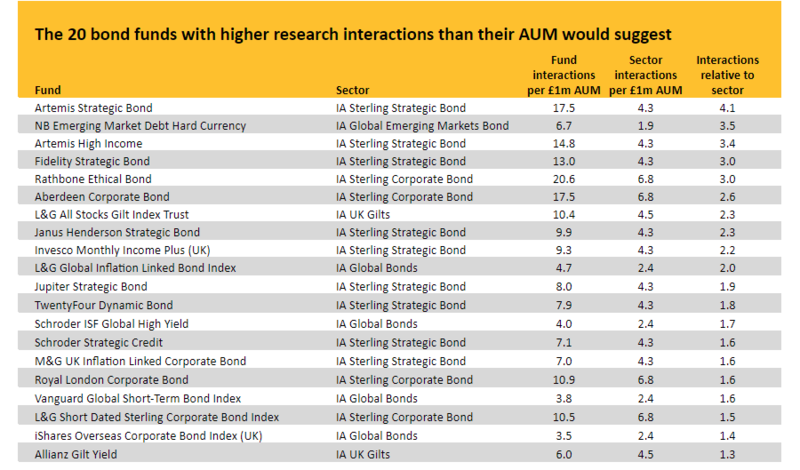 Its 20.6 research interactions for each £1m in AUM is 3.02 times higher than the average for the IA Sterling Corporate Bond sector. When we consider the giant bond funds that are being researched less on FE Analytics than their size would suggest, the list is topped by Pimco GIS Income. This fund is one of the largest in the Investment Association universe with assets under management of £46.6bn. However, it has received just 0.03 research hits per £1m, compared with 4.3 for the average IA Sterling Strategic Bond members. Like many of the funds included on the above list, this is largely down to the fact that the bulk of its assets are held by non-UK investors and the fund is therefore being researched less frequently by those based in the UK. Heartwood Investment Management’s Nikki Howes examines the tailwinds and headwinds that investors in European equities need to be aware of. Investors could be forgiven for avoiding European equities in recent years given lacklustre economic growth and political uncertainty but Heartwood Investment Management believes there are a number of positives for region. That said, the asset management house also thinks there are notable headwinds which mean investors should be reluctant to take hefty bets on the region if conditions continue to deteriorate. 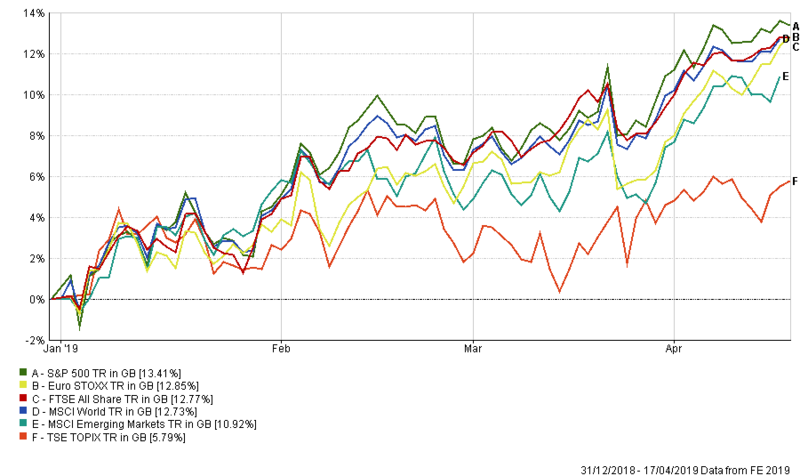 Over the past five years, the Euro STOXX index’s 35.93 per cent total return (in local currency terms) has underperformed the FTSE All Share, MSCI Emerging Markets, MSCI World, S&P 500 and Topix. The S&P 500 made 69.34 per cent over this time. 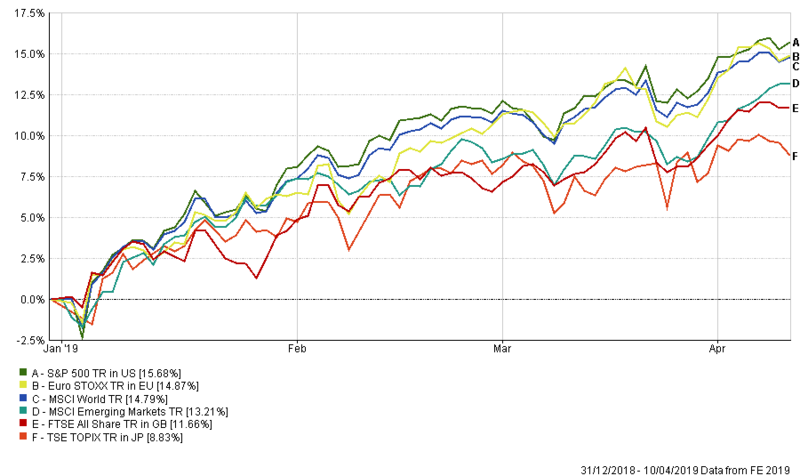 Over 2019 so far, however, European equities have rallied and – as the chart above shows – have outperformed most of their international peers with a total return of close to 15 per cent. Nikki Howes, investment associate at Heartwood Investment Management, noted that there is a “mixed” economic picture for Europe with conditions in its manufacturing sector worsening over 2019 while the service sector has held up “relatively well”. So how should investors approach European equities against this uncertain backdrop? Howes pointed out that there are a number of reasons to be optimistic about the outlook for Europe, not least the fact that weakness in the euro is good news for its exporters. The euro has been weakening against the dollar since mid-2018 and, as Europe exports more than it imports, the region’s exporters benefit from the value of their foreign earnings increasing in euro terms. In addition, recent pledges from the European Central Bank to keep monetary policy supportive contributed to a further drift down in the euro, which should continue to benefit European stocks. The second reason to be positive on European equities, according to Howes, is the fading impact of several one-off issues that now appear to be done with. “Some of last year’s European stock market weakness can be attributed to a confluence of one-off events, from new emissions testing regulations and abnormally low Rhine river water levels in Germany to Italian budgetary woes and populist protests in France,” she said. Another one-off factor that appears to have held back growth in 2018 was manufacturing companies de-stocking after accumulating large inventories in 2017, but recent data suggests stock levels are now back to desired levels – which means another constraint on growth may have been removed. Finally, low unemployment in Europe is another positive for investors as it bolsters the economic outlook. European unemployment is close to historic lows, putting upward pressure on wages and helping to support household spending. “More importantly, the direction of travel is towards continued strengthening: unemployment has not risen once since 2014,” the Heartwood investment associate added. However, Howes also highlighted three reasons to be wary about Europe, starting with the risk that US president Donald Trump could look to target trade tariffs towards the region – especially on its important car manufacturing sector. “Auto tariffs have already been threatened, although Europe has been quick to note that it would retaliate, and in any case there appears to be little support in US Congress for the tariffs,” she said. Furthermore, Howes noted that slowing Chinese economy would have knock-on effects on Europe given the trade links between the two. The European manufacturing sector has already witnessed declines as Chinese growth faltered. While Chinese authorities have taken steps to support the economy – which is the world’s second largest – the benefits have yet to show up in hard economic data. “A continued slowdown in China would certainly hinder European growth prospects, which in turn would spell bad news for European stock markets,” Howes warned. The third reason to be cautious on Europe is one that no-one in the UK is likely to have overlooked: Brexit. The UK and Europe have close economic ties and the EU bloc is the UK’s largest trading partner. A ‘hard’ Brexit, which is still seen as a possibility given the UK’s inability to discover exactly how it wants to leave – would have a “markedly detrimental” impact on an already fragile European economy. Howes concluded that investors need to tread carefully when it comes to Europe as the economic outlook is so open to interpretation. “Overall, we believe the domestic European picture continues to look relatively healthy, with positive labour markets and the potential for exporters to benefit from a weak home currency. We are also encouraged by signs that some of Europe’s previous hindrances to economic health are fading,” she said. Saracen Fund Managers’ Bettina Edmondston examines how consumer staples companies took a wrong turn in the past few years. “The consumer goods industry is in turmoil, I need to act now” – Stefan De Loecker, CEO of Beiersdorf, whose main brand is Nivea. The above quote and the consequent margin reset of Beiersdorf illustrate very succinctly the view we have had on the staples sector for the last few years. There are multiple headwinds for the top line in this sector: lower volume due to a backlash against big brands and a rise of niche brands, low to zero pricing power (both with consumers and retailers) and slow and/or lacklustre innovation. The result is that organic growth, which reached high single-digit to low double-digit levels just before the financial crisis, has been coming down to the 3-4 per cent level. To counteract this, companies tried to cut costs and increase margins. However, ZBB (zero based budgeting) and severe cost cuttings led to a reduction in marketing and R&D spend, which in turn led to the aforementioned slower innovation. Our belief is that if you are a consumer-orientated company, it is imperative to invest in innovation and marketing to continuously keep your customers interested in your products. However, many large companies took the alternative approach and are now paying for it with low or even declining volumes. An excellent example is KraftHeinz. Between 2014 and 2017, KraftHeinz’s margin expanded by close to 10 per cent with the result that volumes deteriorated and were consistently negative during 2017/18. This was not sustainable. At the full year presentation, we learned that some brands suffered so badly in the wake of cost cutting and changing consumer tastes that their brand value had to be written down. Both Kraft and Oscar Mayer brands saw their carrying value reduced by a combined $15.4bn. This was the big wake-up call the industry needed. We now expect to see companies increasing investment back to a more sustainable level in order to regain customers’ favour. However, this additional spending will drive down margins. At Saracen we have reduced our exposure over recent years. However, we are not ruling out buying staples share again. The issue is that most of the defensive staples are still trading on close to 20x Y1 consensus PE, with the caveat that the consensus ‘E’ is probably too high. On this multiple, we could not justify owning these shares at present. The exception to the rule is Mondelez. The company was spun out of Kraft in 2013 and represents mostly the old snacking business: biscuits, chocolate, gum and candy. It had a slightly different strategy to most staple companies. Over the last few years it invested heavily in innovation and has excelled at bringing new and exciting products to the market. 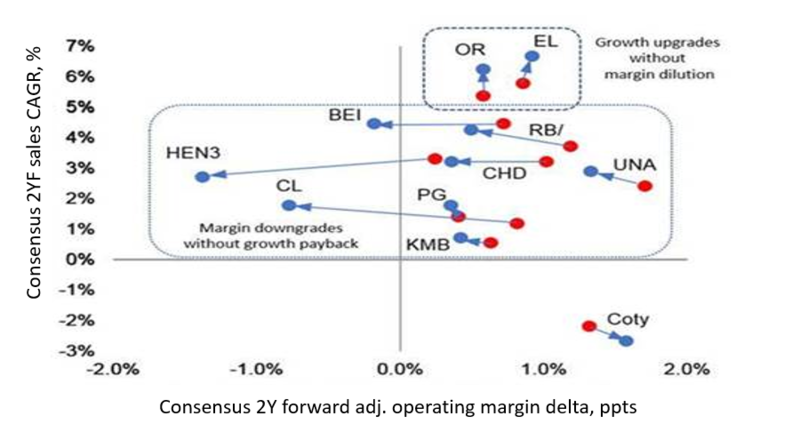 Also, when Dirk van de Put took over as CEO in April 2018, he made clear that his emphasis would be on top line growth and not margins. Looking at Mondelez’s products, you would be forgiven if you thought they were in terminal decline as everybody is trying to eat more healthily and cut out chocolate and sweets. However, the snacking industry is growing in high single digits in emerging markets and low single digits in developed markets, partly because of time constraints and more on the go eating due to longer commutes. Mondelez is trying to capture this with innovation like chocobakery, which combines Milka and Oreo, mindful snacking (smaller portion sizes) and improved ingredients: non GMO, wholegrain, gluten free, low sugar, high protein. 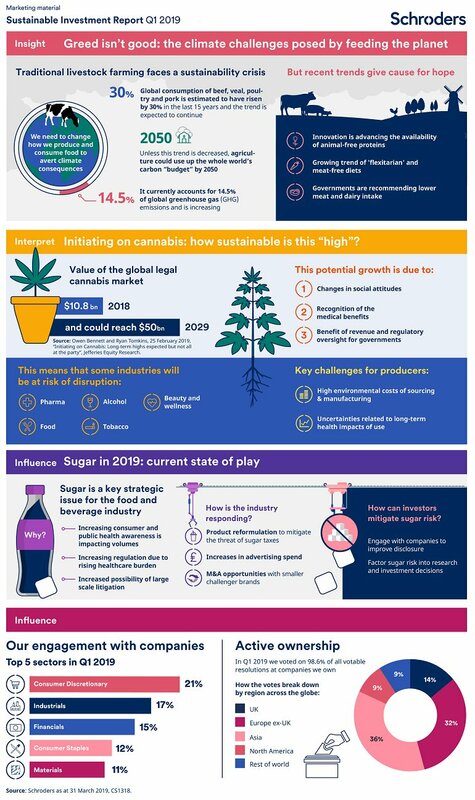 We also like the fact that private label exposure is very low and that Mondelez generates 40 per cent of its sales in emerging markets, which grew close to 6 per cent in 2018. We bought the shares in June 2018 and have already seen a strong rerating as the market is getting more comfortable with the company’s strategy and business model. Another approach is to invest in advertising companies as the fall in the marketing spend of consumer staples companies, which so hurt the likes of WPP and Publicis in 2016-18, looks likely to be reversed. Our holding in Interpublic (IPG) plays to this potential. It is the fourth largest advertising and marketing services conglomerate globally. Like all agencies IPG suffered in 2017 amidst the slowdown in ad spending, especially in the fast moving consumer goods (FMCG) industries. However, the company’s exposure to FMCG companies was relatively low compared to its peers. Recently it has been gaining new contracts, which, added to its sector exposure versus WPP and Publicis, sets it up as the main winner among the top 4 global advertising companies. During 2018 the company singled out that the FMCG vertical was one of the top performing sectors for the group. Management put this down to its ability to adapt to rapid changes and gain contracts. This trend should continue as the competition (WPP and Publicis especially) are only just starting to acknowledge the fact that their business models are too rigid and they will have to go through a transition period; something IPG did in the early 2000s, therefore being a decade ahead of its peers. Interpublic posted 2018 organic revenue growth of 5.5 per cent and we expect this to continue into 2019-20. Margins increased by 70bps and again, there will be more to come. At 12x Y1 PE and with a 4.3 per cent yield, we view the valuation as very attractive. Consumer staples took a wrong turn, stepping away from a focus on brands and detailed, on-the-ground consumer research and paid heavily for it. Currently a reset of the sector is taking shape but it is too early to tell whether this will turn matters around sufficiently for the stocks to become interesting to value investors. There are still opportunities in this sector, either among some of the companies that stood apart from the rest and developed their brand or by betting on those firms likely to benefit from the return to an advertising and marketing focus among consumer staples companies. Bettina Edmondston is a global analyst at Saracen Fund Managers. The views expressed above are her own and should not be taken as investment advice.